Messy conditions. Inclement weather. These Work Boots go hog wild for it. On the outside, waterproof protection keeps you dry while the Duratread outsole resists all kinds of hazards typically found at worksites, farms and ranches. Inside, multiple layers within Advanced Max technology design provide extra shock absorption and stability. Advanced Torque Stability Max technology. ATS Max. Inside, the moisture-wicking insole provides dry comfort. The gel cushioning with heel stabilizer supports while returning energy. Even the EVA midsole absorbs shock. And an extra-wide shank has stabilizers for superior support and reduced fatigue. Outside, the Duratread oil and slip-resistant outsole provides max wear-resistance while remaining flexible. All together, that's enhanced workplace performance, especially at slick sites. Order these Ariat® Western Work Boots! 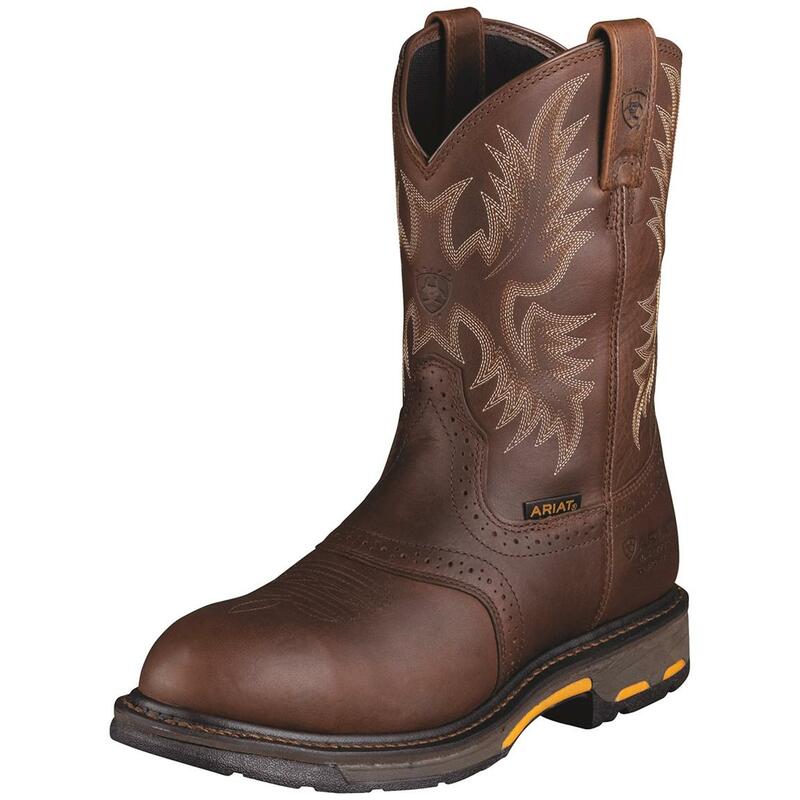 Ariat Mens WorkHog H2O Waterproof Composite Toe Western Work Boots is rated 4.7 out of 5 by 32. Rated 5 out of 5 by Frank M from Enjoying these boots Had them about a week , took a few days to break in till the point I can now have them on for fourteen hour days. Have been very supportive, the fatigue factor comes from the top of my feet due to the snug fit at this area. I think this is more my fault then the boots, I have plantar fascitis in both feet and have to use a thick sock, compressive sleeves and orthotics, so I have placed a lot inside the boot. As I have wore them the leather has relaxed to be more comfortable. Entry and exit have not been any issue. I work in construction, boots still feel good after a day of climbing and standing on a ladder. Rated 5 out of 5 by Matty from Great boots! After purchasing these 2 months ago I feelthat I have put them through the ringer. From -5F degrees to 75F, snow, ice, ponds, and puddles. Well today it was 10 and I was in some water over the heel for at least an hour. My feet are still one hundred percent dry from any outside moisture. I didn’t expect these things to hold up with barbwire scrapes and scratches all over, I expected water to seep in and have some cold digits. I am impressed by these boots, and I’ll be an Ariat customer for life. Thanks, Chris M. P.S- The fit is just a tiny bit large in size and width. But with some thicker socks it’s just fine. I am also inbetween 12-12.5. So that doesn’t help much. Rated 3 out of 5 by Electrician95 from Great boot! Fits comfortable but it has problems I wore these boots doing shut down work as an electrician working 12+ hours a day 7 days a week and after about 4 months the inside pulled away from the leather due to heavy sweat from the July heat, this made the boots impossible to get off everyday. It's a great boot but not a boot I'd wear in hot environments. I wish they had this same style without the liners I'd definitely buy those sacrificing the waterproof aspect of the work boot. Rated 5 out of 5 by Timbo from Great Boots!! I'm convinced to that Ariat is the boots for me. I have four pair of ariat boots and one main reason is, they are TRUE size. The work hog boot is comfortable, water proof, good looking and great leather style. Oh yes, easy on/off at the airports. Rated 5 out of 5 by Iceman65 from Best Boots Ever This is my second Pair of the H2O Workhogs and for the environment I work in day in and day out, these boots are built to with stand them all. The first pair I bought was 3 yrs. ago, I have not tossed them out, they now have made it to the hunting lease. I would highly recommend these boots to anyone in my trade and have. Rated 5 out of 5 by Big D Hamilton from Greatness right out of the box These have got to be hands down the best pair of boots I have ever worn straight out of the box no break in time at all just straight comfort from the first time I slipped them on and after two weeks of hard abuse there holding far better than I expected!